An educational party game which teaches kids shapes and colors. 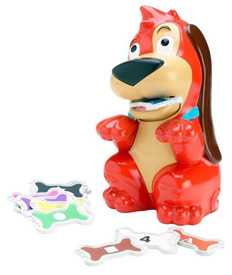 The object of the game is to collect the most bones by matching colors, numbers, shapes, or letters. Press Red Rover's nose and he speaks out which bones to bring. Whoever brings the matching item back first wins. The bones are placed randomly around the area. This is a lot like the games that are played in the Big Brother house as houseguests must find items that are named.